You guys, I’m so glad you’re here today because this magic vegan caramel is legit silky, creamy, and luscious. Wait, I know -> vegan. Which is interesting since I’m not a vegan (remember how the last recipe I posted was, um, a LOADED MEATBALL PIZZA?) and lots of you aren’t vegan either, but one of my favorite food terms is Everythingtarian. Right? s/o to Holly way back in the day for introducing me to that term with her funky blog. Since then, you and I and our POY food corner of the internet have totally identified ourselves with the Everythingtarian food culture, which to me means that you basically eat all the things. It’s a little bit meatball pizza, a little bit vegan caramel, and a little bit detox lentil soup. It’s Everythingtarian, Flexitarian, Food Eatertarian. It’s yummy. You down? Like 99% of recipes in my life, this magic vegan caramel was a happy accident that was inspired from making Angela’s Strawberry Oat Crumble Bars – the ones with the juicy, sticky jam? Yeah, those ones. I was just following the recipe, doing what Angela instructed, and all of a sudden I looked down at the mixture I was whisking and I thought: hey, that looks like caramel. A really BOMB caramel. A really BOMB VEGAN caramel. I wonder if we could make a version of this that would just be straight vegan caramel sauce for eating? We could and we most definitely did. But we’re in the heart of October now, so highest on my agenda is generously bathing all my gorgeous fall Honeycrisp applies in this liquid gold and repeat, and repeat, and repeat. It’s too good for words. This is fall magic! ✨ Make it and love it. Magic Vegan Caramel Sauce made with coconut oil, real maple syrup, and almond butter. Microwave for one minute. SO GOOD! 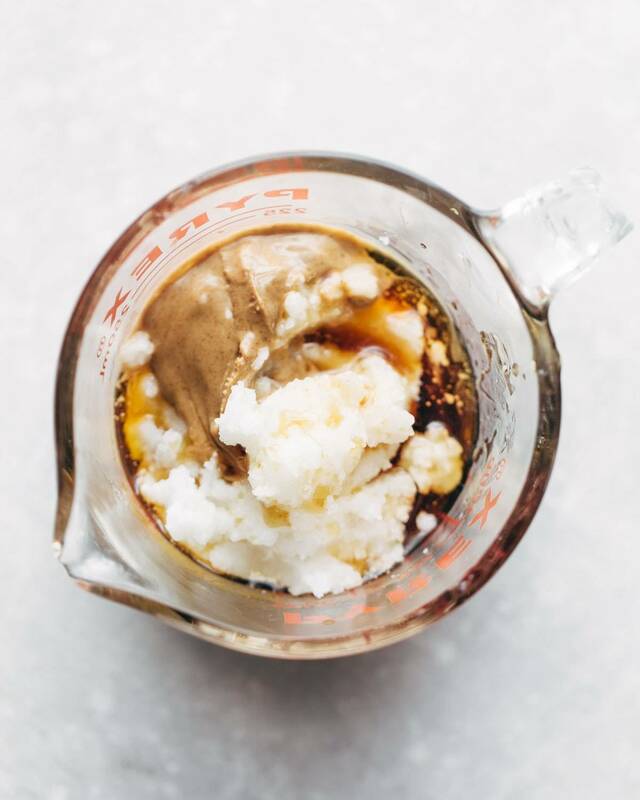 Melt the coconut oil and maple syrup together in a glass container for 1 minute. Whisk in the almond butter for about 30 seconds until fully incorporated and very smooth. I’m not saying you HAVE to, but using cookie butter in place of almond butter is so dangerously good. And cookie butter is vegan (at least the one I bought is). Who knew. I added a pinch of salt to this recipe and I was so impressed with the taste! Delicious! will firm up enough. What do you think? Yum! Glad to hear that, Clara! Hi! Do you think I could use cashew butter instead of almond butter in this recipie? Or is almond best? Thanks! Made this with peanut butter instead of almond because it was all I had and it was amazing! I poured it on popcorn and then popped it in the oven for a few minutes, it was fab! Just wondering how this caramel sets? I want it to firm up so I can use it as a caramel layer in a dessert – like a vegan millionaires shortbread! Thanks! Quick question though, what would you say is the shelf life in the refrigerator? 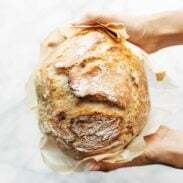 recipe and tried it today. However my caramel did not thicken the way your pictures shows. It stayed very runny. The taste was amazing! I just need to get the texture right. Please tell me if I did something wrong! All same ingredients and ratios except added a teeny amount of vegan butter. Like a shaving. 2. My coconut oil had small balls in it, so I had to stir the maple syrup and coconut oil longer than a minute for them all to melt, before adding the almond butter. 3. I started with medium low heat, then increased just a smidge. 3. I stirred continuously over heat for a total of 5-7 min. I figured it would firm as it cooled, but I waited 15 minutes and still runny. I even tried whisking it more vigorously to add air. Same. 5. I finally put in fridge in hopes that cooling completely will make it firm up. Hi Angela! The caramel will need longer than 15 minutes to start the firm up again. Hopefully the fridge did the trick! Made this last night for family popcorn night. Great recipe, thank you so much. I highly recommend it! Thank you SO much! This was AMAZING. I really didn’t know vegan caramel was possible. I used it on an upside-down pear-ginger cake for my bed & breakfast. (We’re in Grand Marais, MN, so stop and say hello if you’re ever up north on Lake Superior). Do you think this would be thick enough to use for candied apples? I have a son with dairy allergies so this would be perfect! Hi Sam! We’ve never given it a try, but it doesn’t harden quite like real caramel, so we’d guess it probably won’t work too well. This is more of a caramel apple dip. Hi! Happy October. Has anyone tried dipping whole apples in this sauce ala caramel apples? Want to make for a kid’s party. Thanks! It gets solid in the fridge, so I assume if you refrigerate the covered apples it would work. Even pop them in the freezer for a quicker set. we have a nut allergy – any chance I can substitute sunbutter for the almond butter? Yogurt is vegan! There’s coconut vegan yogurt. I am wondering what brand of almond butter you used. I used natural from Costco and the end result is like a really thin, sweet almond butter. Gritty and strong maple syrup taste. Maybe I just had too high of expectations for a “real” caramel sauce. Still tasty! This caramel sauce is sooo good!! I must admit that as soon as it was done I slurped up spoonfuls of it right out of the pan. Quick and Easy to whip up and it satisfied my sweet craving for caramel. 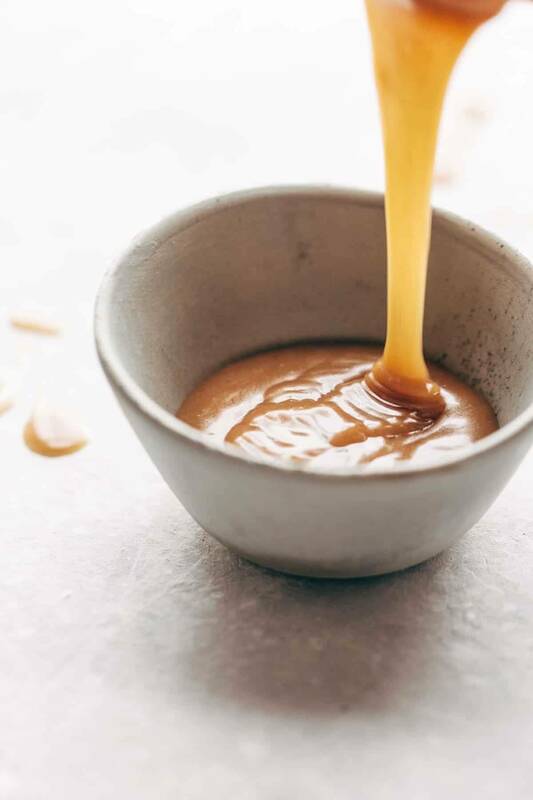 Thank for this alternative healthier caramel recipe. I will be making it often. PS… I have made many of your recipes and have enjoyed them, sure appreciate you posting them with such lovely pictures to entice me. Did what it said but it didn’t taste anything like caramel sauce, not sure if I missed something. Thanks for the idea. Wow, this is simple and delicious! Just doubled the recipe to have extra, wondering how is it is best stored? Thank you in advance! We’s store it in the fridge and then just reheat a little when you’re ready to use it to loosen it up! Hi, I’m late! I was searching for a vegan caramel sauce to use in a vegan snickers recipe. This looks and sounds good, but will it resemble the taste of caramel enough to sneak it in? this is so yummy! How long do u think it would stay good? Do you think Agave could be substituted for maple syrup? It will change the flavor a bit, but the consistency should be about the same! How this just worked and tasted so good is blowing my mind. But I won’t question it and I’m saving this recipe. Thank you!